The two clubs were comfortable winners of their semi-final clashes today. 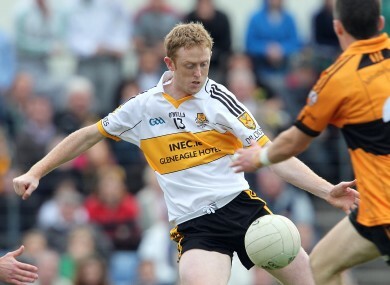 Colm Cooper will be in action for Dr Crokes in this year's Kerry county final. DR CROKES AND Austin Stacks will face off in this year’s Kerry county senior football final after today’s semi-final action. Dr Crokes will be bidding for a fourth consecutive title after they were 0-14 to 0-4 victors over Kerins O’Rahillys in today’s curtain-raiser at Austin Stack Park in Tralee. And in the second game at the venue, it was home side Austin Stacks who ran out comprehensive winners over North Kerry divisional outfit Feale Rangers by 3-12 to 0-3. The victories mean the Killarney and Tralee based clubs will be in action against each other in a repeat of the 2010 final which Dr Crokes triumphed in by 1-15 to 0-11. Dr Crokes will enter the game as strong favourites after seeing off Kerins O’Rahillys comfortably today. The reigning champions enjoyed a 0-6 to 0-3 lead after a competitive first-half. Barry John Keane had showed up well for the Strand Road club while Kieran O’Leary and Brian Looney kicked good points for Dr Crokes. But Dr Crokes kicked on after the break with Daithi Casey and Colm Cooper amongst their second-half scorers as they eased to a 10-point victory. Kerins O’Rahillys could only muster a single point in the second-half and their chances of victory were firmly ruled out when Dr Crokes netminder David Moloney denied David Moran from the penalty spot with ten minutes left. Austin Stacks will be bidding for their first title since 1994 – when they defeated Dr Crokes in a final replay – after thrashing Feale Rangers in today’s second semi-final. Austin Stacks dominated from the off with Pa McCarthy finding the net in the first-half and they lead by 1-7 to 0-2 at the interval. Ronan Shanahan and Darragh O’Brien found the net in the second-half as the Tralee-based club ran out winners by an 18-point margin. Email “Dr Crokes and Austin Stacks set for Kerry county final showdown”. Feedback on “Dr Crokes and Austin Stacks set for Kerry county final showdown”.